the opening was great and so fun to spend time with the other artists whom participated in the show! 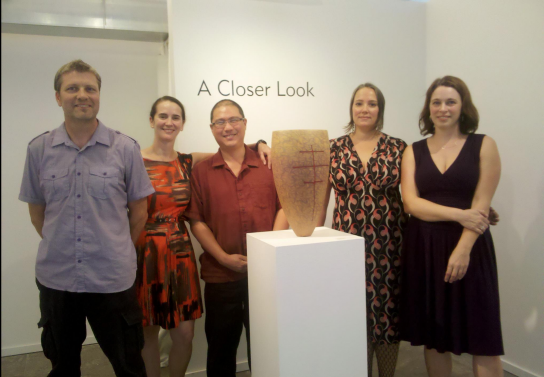 Left to right: Paul Cunningham, Paula Stokes, Boyd Sugiki, Chuck Lopez, Kait Rhoads and Grace Meils. Here is a link to a web catalog for the show created by Grace Meils, the Curator. Kait Rhoads’ childhood was divided between rural Virginia and a sailboat in the Bahamas and Caribbean. The experience of growing up on the water had a profound influence on her, and has been a great inspiration to her in her artwork. She has, at times, focused on literal interpretations of kelp, coral, or other sea creatures. Her recent Sea Stones series, however, is more poetic and merely hints at its watery origins: simple forms, with subtle shifts in color and quick glints of light that sparkle like sunshine on a wet surface. In my Soft Sculptures series, I use hollow glass murrine to describe the boundary of sculptural forms. The hexagonal shapes of the murrine interlock seamlessly; their compartments evoke the empty wax storage containers manufactured by bees and the cellular structure of coral colonies. Combinations of opaque and transparent color alternately highlight the architecture of the form as a whole and the perforated topography of the surface. As in the use of dots of paint in pointillism, the individual murrine can combine to form images from a distance as well. At a smaller scale, I can indulge in specific investigations of color or texture complexity on simple, evocative forms. I am presented with a different set of questions when making more abstract works. How can I make a form not quite recognizable via texture–or incredibly dynamic with an unusual use of color? In this series, I choose amorphous shapes that ask to be stroked or touched – non-threatening, inviting, whimsical shapes. Their scale, surface, and playful attitude invite different interpretations from curious viewers. The soft forms and other woven pieces composed of hollow murrine are created through a labor-intensive process. Using a steel hexagon-shaped mold, I blow different colored glass bubbles and pull them out into a hollow rod shape. These rods are cooled, annealed, and then cut into small, beadlike pieces either by hand or with a diamond saw. Finally, the beads are heated in a kiln to soften their edges. This step tapers them slightly, making it easier to create a flowing curve when I weave them together with copper wire. Kait Rhoads received her BFA in Glass from the Rhode Island School of Design in 1993, and her MFA in Glass from Alfred University, NY in 2001. She has been a PONCHO Artist in Residence at Pratt Fine Arts Center, and the recipient of numerous awards and residencies, including the Doug and Dale Anderson Scholarship, Toledo Museum of Art Visiting Artist Residency, and a Fulbright Scholarship for the study of sculpture in Venice, Italy. Rhoads was recently a guest artist at the University of Hawaii at Manoa. She has worked as an instructor at the Haystack Mountain School of Crafts,Deer Isle, Maine, the Penland School of Crafts, the Studio at the Corning Museum of Glass, Alfred University, and Pratt Fine Arts Center in Seattle. Kait has exhibited throughout the US and abroad, and her works can be found in many collections, including the Seattle Art Museum, the Corning Museum of Glass, the Toyama Institute of Glass Museum in Toyama, Japan, and the Glasmuseum in Ebeltoft, Denmark.